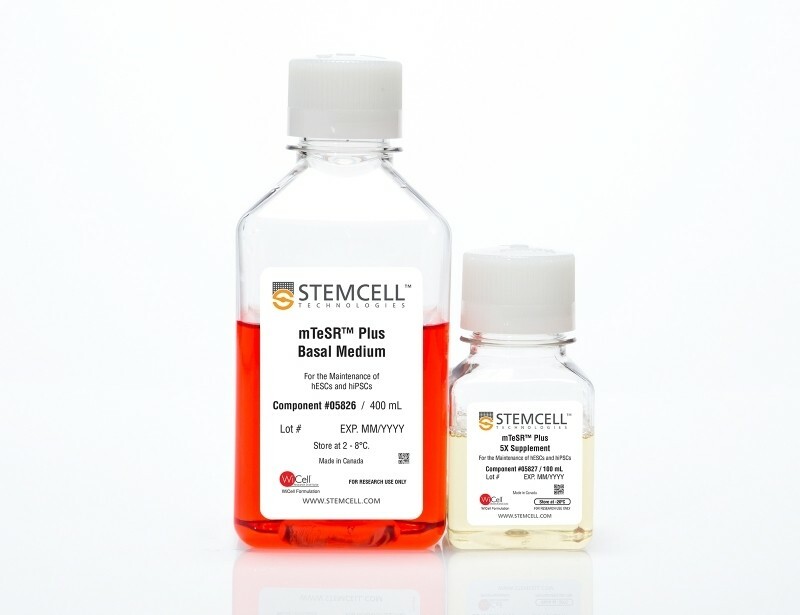 mTeSR™ Plus is a serum-free, stabilized cell culture medium for the feeder-free maintenance and expansion of human embryonic stem (ES) and induced pluripotent stem (iPS) cells. 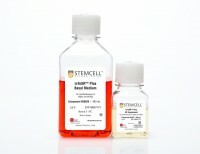 It is based on the mTeSR™1 formulation, the most widely published feeder-free cell culture medium for human ES and iPS cells. To enhance cell-quality attributes during restricted feeds, critical medium components have been stabilized, including FGF2, and medium pH is more consistent. 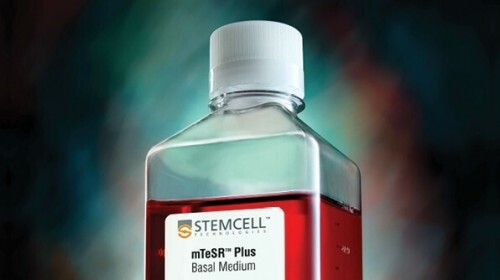 As a result, mTeSR™ Plus allows for greater cell expansion rates with daily feeding, while also maintaining cell quality during restricted feeding schedules. 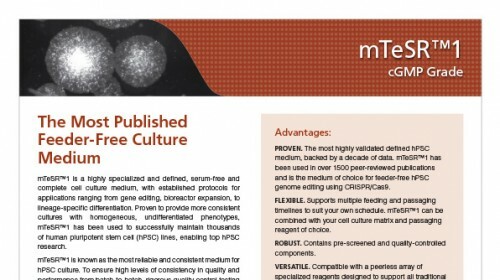 mTeSR™ Plus is compatible with a variety of culture matrices, including Corning® Matrigel® hESC-Qualified Matrix (Corning Catalog #354277) and Vitronectin XF™ (Catalog #07180, a matrix developed and manufactured by Primorigen Biosciences). 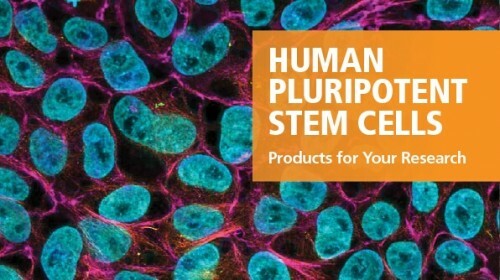 Each lot of mTeSR™ Plus 5X Supplement is used to prepare complete mTeSR™ Plus medium and then performance-tested in a culture assay using human pluripotent stem cells (hPSCs). 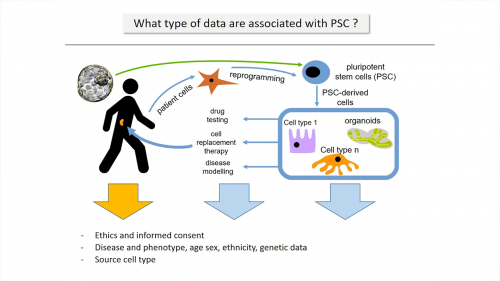 The pH of spent medium from hPSCs cultured in mTeSR™ Plus is higher than that of hPSCs cultured in mTeSR™1 and other flexible-feeding medium at similar cell densities. pH and cell numbers were measured after a 72-hour period without feeding. Range of cell numbers shown represent different densities that would be observed throughout a typical passage. This demonstrates that feeds can be skipped for two days at any time during routine maintenance using mTeSR™ Plus while maintaining a pH above 7.0. Note: Cultures were fed double the standard medium volume prior to the 72-hour period without feeds in all media and cell numbers are from one well of a 6-well plate. 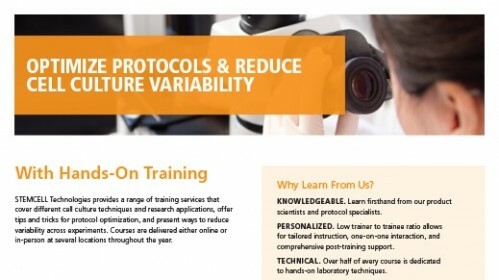 FGF2 levels remain high in mTeSR™ Plus when cultured at 37°C over a 72 hour time period. Measured by ELISA. Growth curves were obtained for human ES (H9) cells cultured in mTeSR™1 or mTeSR™ Plus on Corning® Matrigel® matrix over 7 days with either daily feeds or restricted feeds. 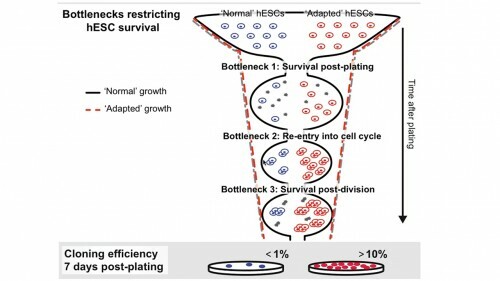 Growth curves were determined by seeding 20,000 cells per well of a 6-well plate as aggregates and counting the cell numbers each day in duplicate wells. The average colony size per passage (± SEM) was obtained for human ES (H1, H9) and iPS (STiPS-M001, WLS-1C) cells cultured in mTeSR™1 (daily feeds) or mTeSR™ Plus (restricted feeds) on Corning® Matrigel® over 10 passages. Size was determined by measuring representative colony diameters at harvest. Note that this data is representative of cultures passaged at a 7-day passaging interval; smaller colony size should be expected if using shorter passaging intervals. Images depict undifferentiated human hES (H1) and iPS (WLS-1C) cells cultured on Corning®️ Matrigel®️ matrix in mTeSR™1 with daily feeds or mTeSR™ Plus with restricted feeds. Cells retain the prominent nucleoli and high nuclear-to-cytoplasmic ratio characteristic of this cell type after 10 passages. Densely packed cells and multi-layering are prominent when cells are ready to be passaged. Human ES (H1, H9) and iPS (WLS-1C, STiPS-M001) cells were characterized using flow cytometry for undifferentiated cell markers, (A) OCT3/4 and (B) TRA-1-60. Graphs show average expression (± SEM) results from analyses of duplicate wells every 5 passages for up to 10-15 passages in mTeSR™1 (daily feeds), or mTeSR™ Plus (restricted feeds). 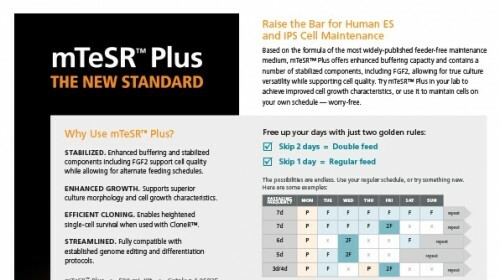 Human ES (H1, H9) and iPS (WLS-1C, STiPS-M001) cells were maintained in mTeSR™1 (daily feeds) or mTeSR™ Plus (restricted feeds). 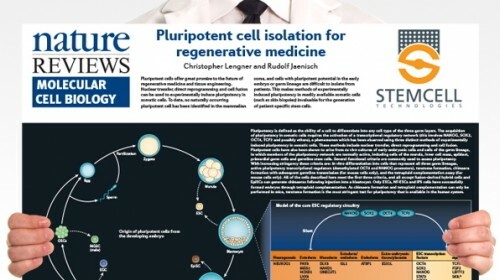 Cells were differentiated using directed differentiation protocols and subjected to flow cytometry analysis. Graphs show average expression (± SEM) results from the 4 cell lines. The markers used for flow cytometry for each germ layer are listed in the bar titles. Karyograms of (A) human ES (H1) and (B) iPS (WLS-1C) cells cultured in mTeSR™ Plus for 12 passages shows a normal karyotype is retained. 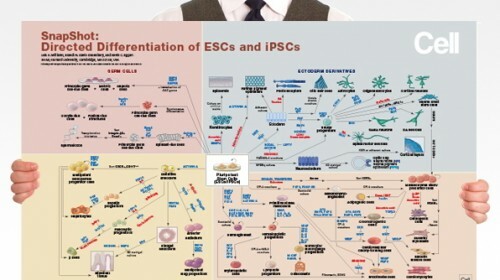 hPSCs (H1, H9, and WLS-1C) plated in mTeSR™ Plus with CloneR™ demonstrate cloning efficiencies equal to or greater than hPSCs in mTeSR™1 with CloneR™. Cells were seeded at clonal density (25 cells/cm²) in mTeSR™1 or mTeSR™ Plus on CellAdhere™ Vitronectin™ XF™-coated plates.